After the initial enthusiasm wears off, most American students drop out of a Chinese-learning program and never return. One conference attendee reported that one parents spent 6,000 USD for their child to learn the Chinese language while the child learned only six Chinese characters, and she emphasized that this was not an isolated case. That parents blamed not on their child but on the teaching method for this result. Every illiterate Chinese can speak very well in Chinese. In fact, the definition of illiteracy is that a person is able to speak well while is unable to read and to write. The current method of teaching Chinese language in the United State is a way to produce illiterates, not literacy in Chinese. For the old way of teaching Chinese language, especially as a second language, there are three damned birth defects. Every Chinese written word is viewed as a stand alone character without any logic connection to any other words. That is, there is no association memory at the character level available for memorizing any of those characters. Thus, every word must be learned in sentences, and the true meaning of a word is not learned. Only its application in that particular sentence was learned. This pathway causes three major problems. As a word’s application in different sentences changes, students will have a hard time to grasp the meaning of a word. The true meaning of a word is, often, lost in this process, and students do not truly know a learned word when it appears at a different application. In fact, 99% of native Chinese college graduates cannot comprehend the old Chinese classic writings while they know most of those words. Every (100%) native Chinese knows the word 台 and some of its applications, such as 台 灣 、 台 階 . What is the true meaning of the word 台 ? It means a person with a great speaking ability, and its extended meaning becomes “podium.” That is, 台 is a word for salutation, such as in 兄 台 、 台 端 . Yet, how many native Chinese knows about this? Probably, none or almost none. Without a logic memory anchor for any individual Chinese character, students must learn hundred-thousands sentences in order to harvest a few thousands (3,000 is the minimum for reading Chinese Newspaper) Chinese characters, and this is a gigantic task for any young person, including the young folk of native Chinese. Thus, most of young Americans who tried to learn Chinese will turn out to be an illiterate (might be able to speak somewhat) in Chinese even after he has invested a few years (3 to 5 years) in studying it. The pronunciation of many Chinese characters cannot be read out loud from its word form. That is, the sound of a character is not a memory anchor for it but is an additional burden for the memory. In terms of illiteracy on Chinese, reading Chinese characters is not an easy task. Yet, the most difficult task is to write Chinese characters which have unique forms for every and each Chinese character. Writing every Chinese character correctly is a major task even for the native Chinese, let alone for someone who learns them as a second language. Because of these birth defects of the Chinese written language, it takes 6 to 7 years for native Chinese to learn three to four thousand words (just being able to read newspaper), 12 to 16 years to learn five to six thousand words (still below a true literacy in terms of Chinese literature, which needs over twelve thousand words). However, if Chinese written language (words) has a chemistry-like logical structure, from atoms to molecule to higher chemical compounds to bio-chemistry to organs to lives, then Chinese written language can be learned just by learning a few atoms and a few bonding rules. As these atoms and rules are few, its entirety can be learned in a few months, perhaps, in three months. As the entire Chinese written language universe is described and encompassed by these few atoms and rules, the entire Chinese written language can be learned in three months. In fact, this is the case; the Chinese written language, indeed, has a chemistry-like logical structure. The following is a brief description on that fact. In order to master Chinese language as a second language while without living in that language environment, it must be learned as a knowledge, not as a living habit. However, the majority of English words are stand alone words, such as, book and love. Although most of them do have an origin of some sort (Latin, Greek, etc. ), their meanings cannot be read out loud from their faces. Thus, the followings are the two major differences between English and Chinese words. While some of English words have root words, 100% (not a single exception) of Chinese words is composed of word roots. 書 (book) is 聿 (things made by hand) + 曰 (intelligent speaks). Thus, book is that some intelligent speaks have been transformed into a thing by hand. Bottom part of 夏 (Summer) which means walking slowly. So, love is that hearts hold hands and walk slowly together. Yet, no one ever learns Chinese written words in this way for the past 5,000 years. Chinese words were always learned as stand-alone words which must be learned one at a time. Of course, for native Chinese, they have a life-time to learn them. Seemingly, this is a great strategy to prevent any foreigner to master Chinese written language before he is Sinicized. For the past two thousand years, there were only six sentences describing the Chinese Etymology. For the following reasons, they did not provide a foundation for a word root Etymology. There were only titles ( 六 書 , six ways of constructing Chinese written words) without a detailed explanation text. These six titles do give an external-view outline about Chinese written word system. They do not give a detailed view about their internal dynamics. In short, they are not complete. For the past two thousand years, no one was able to elaborate those six titles further and to construct a system. Now, I will give a scientific description of Chinese Etymology here. As ideographs, every Chinese written word can be viewed as a kind of birds. Thus, the following description (the genealogy and the internal dynamics of those birds) can be understood by someone who knows not a single Chinese word. There are four steps to construct the Chinese word system. 字 根 (Word roots) — word root is the rock bottom building block for Chinese written words. It cannot be reduced any further as a composite of some constituent parts. There are a total of 220 Chinese word roots, and there are two kinds of word root. Root type A (RTA) — it is also a stand-alone word. There are about 75 such word roots. Note: A word can often have more than one meaning. However, when it acts as a word root, it has only one meaning, its original meaning. Root type B (RTB) — about 145 word roots are not stand-alone words. Note: As not stand-alone words, they are often not implemented in the computer, and there is no way to print them out as a character. They are printed out in this book as jpg-graph files. Note: The definition of word root here is similar to atom in chemistry, which is the rock bottom building block to build up molecules and the higher structures. Of course, every atom is still having a sub-structure. However, it is a subject of physics, not chemistry. Similarly, these 220 word roots also have substructures which will be discussed in lesson three. Before then, these 220 word roots are viewed as rock bottom units for dissecting Chinese words anatomically and syntactically. 字 符 (Modules) — module is composed of, at least, two word roots. There are about 300 important modules, and there are two types of them. Module type A (MTA) — compound roots, they are not stand alone words. Again, they are often not implemented in the computer and cannot be printed out as characters. Module type B (MTB) — they are stand alone words. Note: Again, as a stand alone word, it can often have more than one meaning. However, when it acts as a module (a part of other words), it returns to its original meaning. Obviously, 部 首 alone cannot construct a word root Etymology, as word roots (220) + modules (300) is much larger than leading radicals (214). Generation zero (G0) word — RTA words (word roots, yet as stand alone words) . Generation one (G1) word — MTB words (modules, yet as stand alone words) or all stand alone words of leading radical are G1 words. Any stand alone word which is composed of only from word roots (no modules) is also a G1 word, such as, 左 、 右 、 友 、 反 、 祭 … . Generation two (G2) word — G1 word + something (root, module or leading radical). Or, module + something. Thus, theoretically, every Chinese written word can be as a module. The entire Chinese written word system is constructed with the above procedure. The following is some examples of the above structure. Word root (king’s seal), [ 卬 、 卯 、 危 、 怨 、 令 、 命 、 卷 、 卻 …]. In this list, we can see that this word root has three different variants, such as ( 卯 、 危 、 令 ). Note: This word root itself might not be implemented in some computers, and it cannot be printed out. In this case, it is the right radical of the word 卯 or the bottom radical of the word 危 . 卬 , as a stand alone word, it is also a G1 word. 卯 , also a G1 word. G3 words: 留 、 劉 have a module 卯 , not a radical 刀 . The shared radical of ( 怨 、 鴛 、 宛 ), this module is not implemented as a stand alone word in many computer systems. Thus, there is no stand alone G1 word for this module. Word root 八 , a G0 word. Module ( 卷 、 拳 、 券 ). This module is not a stand alone word. 小 , a G1 word. Module ( 寮 、 僚 ), this module is not a stand alone word. Word root , this root is not a stand alone word, and it is not implemented in computer. Module ( 攸 、 候 ), they are stand alone words, G1 words. Word root 隹 , this root is also a stand alone word, a G0 word. Module 雚 , this module is also a stand alone word, a G1 word. Word root 人 , this root is a stand alone word, a G0 word. Module 僉 , this module is also a stand alone word, a G1 word. With only one example, it can be an incidence. With only two examples, it can still be an coincidence. With more than three examples, it happens as accidence becoming very unlikely. There must be a underlying system driving the phenomena. In fact, the Chinese written word system is almost identical to a chemical compound system. By knowing all names of chemical elements, the names of chemical compounds can be read out loud easily. The word roots are the chemical elements in Chinese written language. By knowing all functions of Chemical modules (such as, benzene, enzyme, etc. ), the functions of most chemical compounds can be again read out loud easily. It is the same for Chinese written words. After May fourth movement of 1919, Chinese scholars unanimously agreed that, being a denotative solitary and non-logical language, Chinese written language was the culprit for China’s demise at that time. For over five thousand years, not only was Chinese government advocated learning as the only pathway to participate in politics but the tradition of countryside also viewed that studying was the only way to a personal prosperity. Yet, by 1950, over 85% of Chinese people were still illiterate because that Chinese written language was too hard to learn even for the native Chinese. Thus, the calling for converting Chinese characters into Roman alphabets was the slogan for China’s culture elite in the 1950s. By 1958, this alphabetizing of Chinese characters was not yet successful. The Chinese government launched simplified Chinese character system as an interim measure to reduce the illiteracy in the country. By 2006, the illiteracy in the country was less than 15%. Thus, the simplification of Chinese characters was viewed as the greatest achievement of Chinese government. In April 2006, Chinese government issued The law of using the Standard (simplified) Chinese Characters in public place, which encompasses all the publications (books and newspaper) and all the street signs. Any way of violating this law is prohibited and will be fined severely. 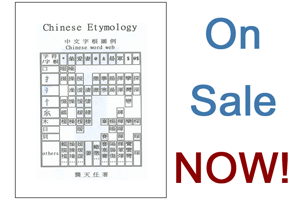 In May 2006, Chinese Etymology was published. By only learning 220 root words and 300 sound modules, one can master all (60,000) Chinese characters. The meaning of each and every (100%) Chinese word can be read out loud from its face according to that book. That is, someone who knows not a single Chinese word can master the entire Chinese written language in six months as that course can be easily scheduled as a 200 hour course. 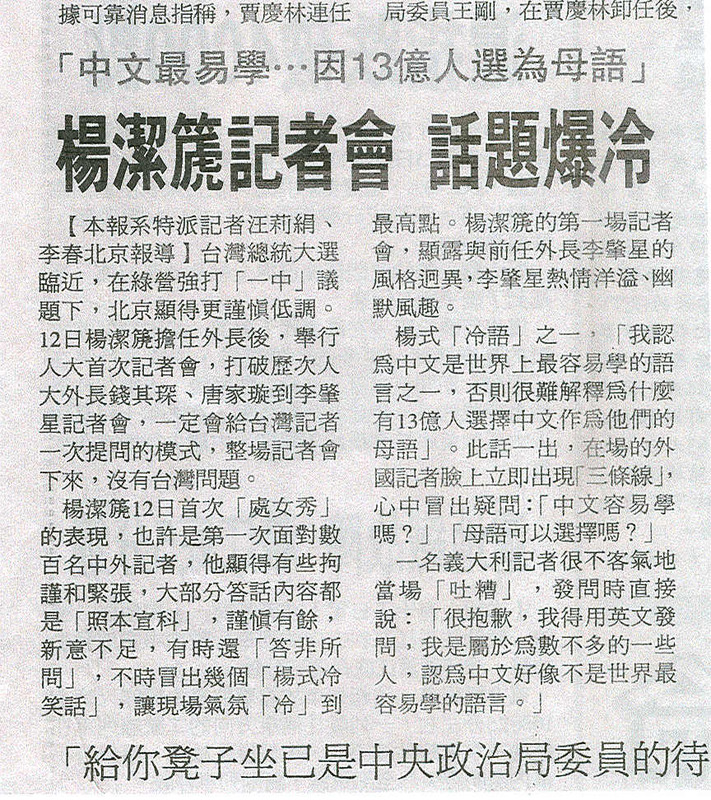 After this fact was known, a news report (on November 4, 2007 by Chinese Daily News, P.O. Box 2032, Monterey Park, CA 91754) stated that Chinese government is now contemplating of going back to the traditional Chinese characters. The graph on the left is the copy of that news report. On March 12, 2008, Chinese Daily News reported a news conference which was hosted by the Foreign Minister of China, and it was the first news conference in his three years in the office. In that news conference, he popped out a strange statement that Chinese written language is one of the easiest language to learn in the world. His statement was immediately rebuked by an Italian reporter. She said, “Minister, I must ask you question in English as I am one of those who is unable to learn that easiest language.” Of course, Minister Yang did not retract his strange statement, and it was reported as a cold joke by all Chinese newspapers. The picture on the left is a copy of that news report. On March 15, 2008, Chinese Daily News again reported that one branch of Chinese Parliament (similar to US Senate, composed of from different political parties) initiated a bill for teaching the traditional (not simplified) Chinese character in the grade school (see picture on the left). This is a major reversal for its policy a year ago, and it is an outright putting down China’s greatest achievement, the revolution of Chinese written word system which was attributed as the major force for eradicating the illiteracy in China. That is, this act could be viewed as treason, unless it has become the policy of the government. Seemingly, someone in China has realized that the simplified written language system did not truly simplify it, and Chinese written language can be learned in a much easier manner, in three months.